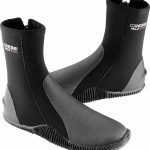 These boots are suitable for any kind of water sports for keep the feet warm. The back of the heel has a special design that fits perfectly with open hell fins for scuba diving. The small boss is used to prevent the slipping of the fins strap. Both the toe and the heel are reinforced with long-lasting rubber and provide protection against wear and tear. They are made from soft, double-lined neoprene and have a practical zip from the sole to the ankle, making them easy to slip on and off. Water seepage is reduced to the minimum thanks to a thin flap seal under the zip, which acts as an effective barrier against any water that may seep through the zip. A strong non-slip molding covers the entire sole. Built-in fin strap holder design on the back of the heel. Built in sole to provide extra protection. Super elastic Neoprene to provide comfort. Thickness of boot provides toughness while maintaining warmth. Toe and heel reinforced with long-lasting rubber.